Maizie Albright may not be an actual private investigator, but she has played one on TV. The former child television star spent nearly a decade portraying Julia Pinkerton, Teen Detective, but Maizie’s out-of-control behavior made her a favorite of the paparazzi and landed her in front of a judge. A court-ordered mandate to leave Hollywood and find a real job led her back home to Black Pine, Georgia, where Maizie was able to convince Wyatt Nash to take her on as an apprentice in his Nash Security Solutions. Maizie’s acting out—a desperate attempt to escape her “momager” Vicki Albright—failed almost immediately when her mother followed her, dragging along the film crew that continued to tape the reality show All is Albright without Maizie’s voluntary participation. Already becoming the Hollywood of the South, Black Pine has been chosen as the filming location for famous producer Leonard Shackleton’s newest movie. He hires Nash Security, or more specifically, Maizie, to essentially babysit his star actress and keep her from violating her liability insurance contract. Maizie knew Cambria when she was Cam-Cam and played Maizie’s best friend on her show, but their relationship never extended off air. This new hard-partying, substance-abusing, hot mess is far from the studious girl Maizie once knew, but she is determined to prove to Wyatt that she’s up to the job and can straighten out Cambria. The assignment goes askew pretty much as soon as it begins, with Maizie finding corpses that disappear, and Cambria proving to be either the culprit or the next victim. This couldn’t be a timelier novel, as it highlights the sexist and ultimately damaging attitude of the entertainment business. Maizie is a product of her environment, since she was three-years-old she has been raised in a culture that glorifies beauty, wealth, fame, and surface-level facades. Maizie’s mother is the epitome of a monstrous stage mother, having established her own career at the expense of her only child. Maizie’s people-pleasing act provides her with an arsenal of on-demand faces, and as amusing as her Teen Vogue, Maxim, and whitening-strip commercial smiles may be, there is a painful undercurrent of insecurity and fear. What began in the previous novel and continues here is the joyful experience of seeing Maizie strive for independence and break out of her show-dog mentality, especially when it means standing up to her mother or lecherous client. The author so brilliantly creates an environment where Harvey Weinstein-like behavior could exist, and demonstrates how actresses must walk a delicate line in order to stay employed and still not be victimized. I love seeing Maizie grow as a character, and I absolutely adore the behind-the-scenes glimpses into celebrity culture. 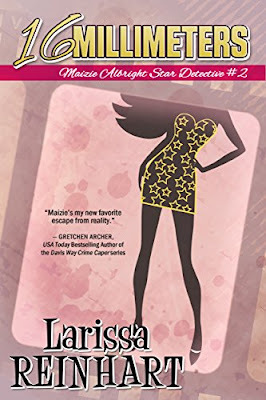 Maizie’s missteps make each of her successes an absolute joy, and I encourage readers to delve into this lively, funny, and genuinely satisfying series. To enter to win a copy of 16 Millimeters, simply email KRL at krlcontests@gmail[dot]com by replacing the [dot] with a period, and with the subject line “16,” or comment on this article. A winner will be chosen December 9, 2017. U.S. residents only. If entering via email please included your mailing address. If entering via comment please be sure to include your email address. Wow! I couldn't be happier!! Thank you so much. It pleases me to no end that you enjoyed Maizie!! Thanks for taking the time to review. This is another new author and series to me. Would love to read. I love this series! Thanks so much for the great giveaway! You have given us a wonderful review. Thanks. I want try this series out.